When hiring a motorhome (especially with toilet and shower facilities) you may want to consider your responsibilities when it comes to waste. Your kitchen sink and shower water (or grey water) travels down the drain and into a holding tank. Similarly, this also happens with your toilet waste (or black water). There are recognised dump points for grey water and black water all around New Zealand. Toilet chemicals must be put into the toilet to prevent sewage odours and to aid in the breakdown of sewage and toilet tissue. These chemicals ensure easier emptying of the black water tanks. A demonstration of how to empty the tanks is provided at the time of pick up. So where are the dump points? Why should you dump your waste! It has been proven that the easiest way to improve your fuel consumption and mileage is to dump your tanks regularly. This will save your hip pocket from the inevitable increasing fuel prices. When returning your vehicle, the toilet and waste water holding tanks must be emptied. Hefty fees apply if the branch staff are required to do this for you. 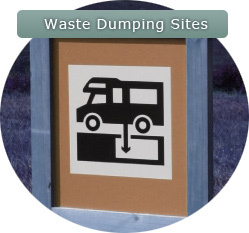 Opt to use public amenities where possible to avoid having to find dump stations regularly. If you are not able, ensure you always dispose of your waste in a proper waste station. Soaps, detergents and other wastes can harm the waterways and wildlife. Be careful that your waste does not pollute our ocean, lakes, rivers or streams. Please remember that not all dump points are free of charge. It might be worthwhile to do some pre-planning to avoid any extra unexpected costs. Why not stay in a caravan park for your last night that offers a dump point free of charge!